In “Symbols and Their Meanings” Jack Tressidder says this of cauldrons, “The cauldron’s ancient links with magic probably originated with its capacity to produce surprising quantities of food and to turn everyday nourishing materials into gastronomic marvels.” Anyone who has had stew made from leftovers knows that “gastronomic marvels” may be an exaggeration, but in this modern era, it’s easy to forget that this now seemingly magical tool was once a cook’s beast of burden. So, in the beginning there was a big ole’ pot. Boy, who would have known where it would end up! The cauldron has turned up in the tales of the Greeks (where under the advisement of Medea, King Pelias’ daughters chopped him up and put him in a cauldron in an attempt to rejuvenate him) and the Celts (for instance Undry, the life-giving cauldron and prized possession of Dagda). Also, who hasn’t heard “Bubble, bubble, toil and trouble. Fire burn and cauldron bubble”? It’s various cameo and starring roles in all these tales lent a certain mythology to the once simple pot. The cauldron can represent plenty, transformation, and rebirth. With the stories of saints boiling in cauldrons, it can also be viewed as a tool of torture. Thus, the cauldron can also symbolize punishment, trial, and initiation. Perhaps it’s these symbolic seeds that have helped the cauldron blossom into it’s best known modern day association…Wicca and witchcraft. 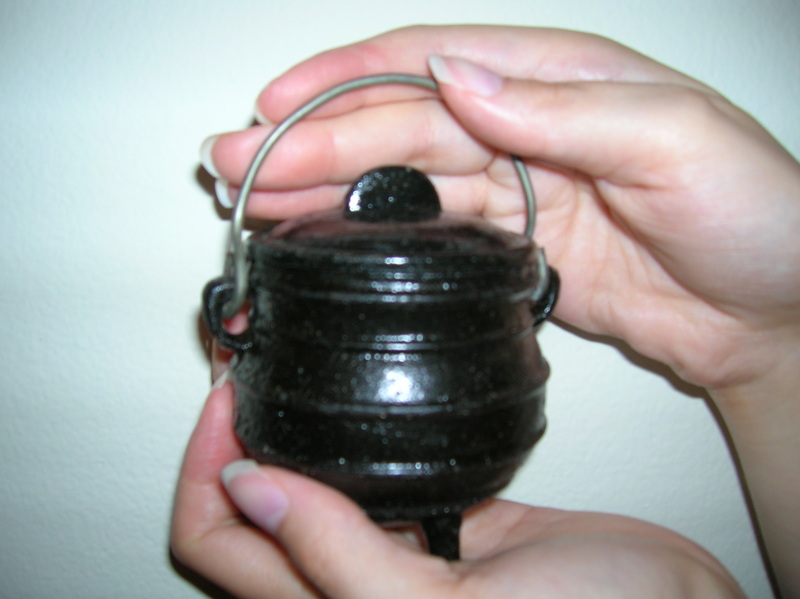 Cauldrons are a common tool/ritual item for Wiccans and other magic practitioners. This once huge metal pot, is now much smaller in size. It’s size is better suited for the modern user, who wants a cauldron for its symbolism and capability for brewing small quantities of potions. You know, we all have crock pots for stew these days! The cauldron is viewed as the womb of the Goddess and many times takes a central symbolic place amongst a circle of Wiccans or Goddess worshippers. 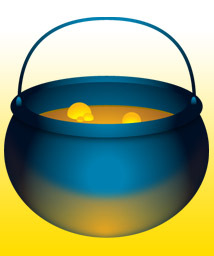 For the knowledgeable magic practitioner the cauldron can be a scrying tool when filled with water. It holds and burns incense or candles. Many burn requests in their cauldrons as well. Here’s Rebecca’s cauldron, forlorn and dusty from neglect.